EFCC therefore urged the high court to dismiss the suit that is seeking to invoke an order of mandamus to compel it to initiate criminal proceedings against the embattled APC Chairman. The suit marked FHC/ABJ/CS/628/2018, which was lodged before the court by Edo State based cleric and activist, Bishop Osadolor Ochei, is urging the court to declare that EFCC has a statutory duty to investigate different petitions that contained allegations of financial recklessness against Oshiomhole. Specifically, the Applicant, alleged that Oshiomhole who was sued as the 2nd Respondent, while in office as Edo state governor, acquired properties in United States of America, South Africa and Dubai worth billions of U.S. dollars and far in excess of his legitimate income. He alleged before the court that the ex-governor built a sprawling mansion worth more than N10billion in his home town known as Iyamho, while in office. “The said cost of building the mansion is well outside the 2nd Respondent’s legitimate income. The 2nd Respondent’s lifestyle and extent of the said property were not justified by his source of income”. The Applicant told the court that he had on November 4, 2016, sent a petition to the EFCC, detailing some corrupt practices he said the ex-governor was involved in. He maintained that EFCC’s refusal to act on petitions containing “weighty allegations” against Oshiomhole, ran contrary to Section 15(5) of the 1999 Constitution (as amended) which enjoined the State to abolish corrupt practices. Meanwhile, EFCC, in a preliminary objection that was signed by its team of lawyers led by the Head of its Legal and Prosecutions Department, Mr. G.K. Latona, aside challenging the locus- standi of the Applicant to file the action, said it has discretion on how to use its available manpower to carry out investigations into petitions submitted to it. “That investigation of cases is a holistic process which entails time, resources, inter-agency cooperation, interview of different persons and gathering of evidence over a long period of time depending on the nature of the case and other variables”, it told the court. Besides, the Commission, in an 11-paragraphed affidavit that was deposed to by one of its staff, Mr. Yusuf Musa, told the court that it conducts its investigations “professionally and discreetly” before the arrest and prosecution of indicted persons. “That 1st Respondent is a statutory body charged principally with the responsibility of investigation and prosecution of economic and financial crimes. “That the 1st Respondent since its establishment In 2003 and till date receives numerous petitions daily in its eleven offices in various parts of the country against different persons both from within and outside Nigeria. “That investigation into these numerous petitions and criminal complaints including intelligence reports are professionally and methodically carried out by the 1st Respondent in line with its staff strength and enabling statute. “That 1st Respondent in carrying out its statutory functions of investigation and prosecution of economic and financial crimes, attends to all complaint discreetly and dispassionately without political, ethnic, religious and other extraneous considerations. “That the 1st Respondent had strengthened the war against corruption with various initiatives amongst which is the Women Against Corruption Coalition and the encouragement of Whistle Blower Policy leading to several recoveries of illicit cash. “That the 1st Respondent has discretion on how to use its available manpower to carry out investigations into petitions submitted to it. 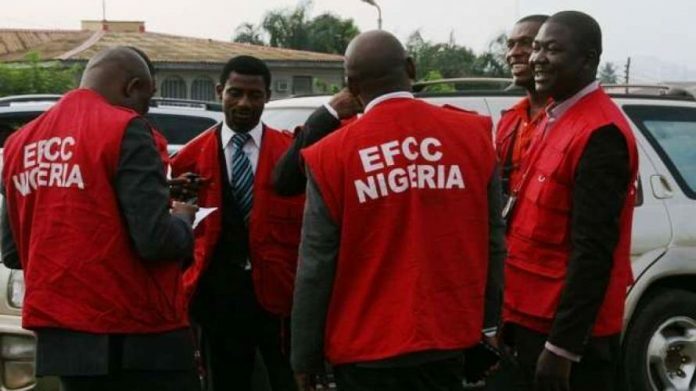 “That Respondent is not under obligation to report or give account of its investigations to any individual or under a timeline within which to carry out its functions”, EFCC averred. It said it would be in the interest of justice for the court to strike out the suit which it said lacked competency and constituted an abuse of the judicial process. In a written address attached in support of the objection, EFCC, argued that granting an order for Oshiomhole’s arrest and prosecution as prayed for in the suit could occasion ” chaos and tumult” in the polity. “It is inimical to the tenor and tenets of a democratic society for an agency such as the 1st Respondent to be directed or compelled to discharge its functions in a particular way or manner, a fortiori the 1st Respondent cannot be directed or compelled to carry out investigations or prosecution as dictated by the Applicant or anyone. “We urge this Honourable Court to dismiss the Applicant’s application, same being unmeritorious and lacking in merit”, EFCC added. It will be recalled that Oshiomhole had also queried the powers of the court to order EFCC to prosecute him on the basis of the suit. While acknowledging the powers of the anti-graft EFCC to probe financial and economic crimes, Oshiomhole, through his lawyer, Mr. Damian Dodo, SAN, contended that the court could not okay him to be investigated on the strength of a petition he said was lodged against him since 2016. He argued that the suit has become statute barred, saying the Applicant ought to have instituted the action within three months after the first petition was filed against him before the EFCC. The APC Chairman noted that the cleric first wrote a letter to the EFCC on October 28, 2016, drawing its attention to the allegations of financial misappropriation he made against him. He told the court that the Applicant wrote another letter that was received by the anti-graft agency on December 13, 2016, reminding it of his pending petition that was allegedly not acted upon by the EFCC. “The action of the 1st Respondent (EFCC) which is being subjected to review by the instant proceedings for Judicial Review, last occurred on December, 2016, while the proceeding for Judicial Review was commenced on 13th June, 2018, eighteen months after the occurrence of the alleged failure being complained about. “The suit is statute-barred by virtue of the facts stated above and the Applicant/Respondent’s right of action (if any) has become unenforceable”, Oshiomhole contended. He maintained that the Applicant failed to show how actions he took while in office as Governor, “affected him over and above other residents and indigenes ot Edo State”. “This Honourable Court is robbed of jurisdiction to entertain this suit for failure of the Applicant/Respondent to commence this action within the time provided by extant rules of this Honourable Court and/or for failure to disclose locus standi to institute the action”, Oshiomhole added. Trial Justice Anwuli Chikere has fixed November 19 to commence hearing on the matter. The petitioner had in his suit, told the court that Oshiomhole, “bought a property along Okoro-Otun Avenue, G.R.A., Benin City owned by Edo State Government while serving as Governor of Edo State in an insider deal without due process and in abuse of his oath of office”. He said the property acquired by the 2nd Respondent was originally given to University of Benin as a gift by Edo State Government. “The 2nd Respondent, while a dispute was pending in Court between University of Benin and Edo State Government, forcibly acquired the property for his personal use. The 2nd Respondent has since erected a structure with an underground apartment, roof-top swimming pool, another giant structure worth more than N500,000,000 (five hundred million naira) which is far beyond his legitimate income. At the time of the sale, the open market price of that magnitude of property and in that such high-brow location was about N100 million naira. “This transaction took place while the 2nd Respondent was Governor of Edo State and he bought the said property for just N23 million naira vide an Access Bank cheque. “The 2nd Respondent authorized and awarded the highly inflated contract and payment within a relatively short time for the construction of a 168 room-hostel in Edo State University, Iyamho for the sum of N1.88 billion naira. The average cost per room translates to N10 million naira for each hostel room. “This contract was awarded to the firm of A & K Construction Limited without compliance with due process. Similarly, the 2nd Respondent authorized and awarded the highly inflated contract of building the Teaching Hospital of the said University for the sum of N12.2 billion naira without compliance with due process. “The 2nd Respondent authorized and approved the diversion of N1.2 billion naira approved for the construction of a new accident and emergency ward complex and renovation of existing structures in the Central Hospital, Benin City for the payment of additional 10% advance payment to A & K Construction Limited for the construction of the Teaching Hospital of the University of Science and Technology, Uzairue (also known as Edo State University, Iyamho) without compliance with due process and against public interest. “The 2nd Respondent borrowed N25billion naira from the capital market through the issuance of bonds. He purportedly paid the first N6 billion naira to Hitech Construction on March 2, 2011 and listed several roads as part of Phase One of the Storm Water Project to include Adolor College road, Textile Mill road, and a host of others. These roads are largely abandoned with little or no work done by Hitech Construction Company. The gullies created as a result of initial work have become major sources of flooding in Benin – City. More than six persons have been killed by this artificial flood. “The 2nd Respondent authorized and awarded the construction of the 7.2 kilometer Ogba/Airport Road, Benin – City to Servetek Construction Company Limited for construction of drainage structures and dualization from Ring Road to Ogba River Bridge for an industry record setting sum of N4.4 billion which translates to N611 million naira per kilometer without compliance with due process. “Following disputes with the Company on how the money was to be shared amongst stakeholders, the Company refused to work further and the contract was terminated. It was re-awarded to Setraco Nigeria Limited for over N12 billion naira, on the pretext that 17 access roads were to be constructed along the main Airport Road. It was later discovered that these access roads were re-awarded as stand-alone contracts with new cost tag. The contracts were awarded without compliance with due process. “The 2nd Respondent authorized and awarded the construction of the Emergency / Accident Unit of the Central Hospital, Benin – City, to an Italian Company for the sum of N2.7 billion naira and later reviewed same upwards to over N3 billion naira. The constructed building subsequently collapsed killing the owner of the Company, Dr. Stefano De La Roca and confidant of the 2nd Respondent. The contract was thereafter re-awarded to another company, SCL without penalizing the previous Company for the poor work done and thereby causing serious financial loss to Edo State. The said SCL is also one of the Companies that constructed the Lord of the Manor Proto-type mansion and adjoining premises of the 2nd Respondents at Iyamho in Edo State. “In 2012, the 2nd Respondent initiated and authorized the approach to the World Bank to secure a loan of $225 million dollars under the First Edo State Growth and Employment Support Credit project with identification number “P123353 ”. The World Bank paid Edo State Government $75 million U.S. dollars as initial payment and another $75million U.S. dollars as second installment, despite massive protest by Edo people. “The said second installment which was domiciled in Access Bank was largely transferred to private off shore accounts and round tripped to the detriment of Edo State. “The 2nd Respondent authorized and approved the counterpart fund scheme between Edo State Government and Bank of Industry with each party providing N250 million naira each. This agreement was reached in December, 2009. From the enquiries made by Applicant, only N41.6 million naira was disbursed. The balance sum was diverted for personal gain and to the detriment of Edo State residents”, the Applicant added.